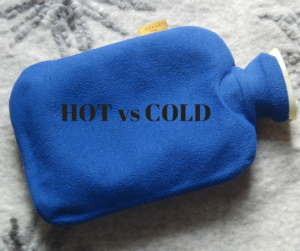 I often get ask the question what is best to apply to an injury, a hot or cold pack? So here is my advice on the confusing subject. I am going to keep it simple without too much medical speak. When to Apply Cold Therapy? As a general rule cold should be applied to an acute/sudden injury ie twisted ankle, torn muscle or bruising. This can be in the form of a flannel placed in very cold water, an cold pack that you have purchased from the shop or a bag of frozen peas. Cold therapy constricts the blood vessel reducing the blood flow to the area. This will help to reduce swelling and inflammation that occurs at the site of the injury thereby helping to reduce pain to the numbing effect of the cold. I advise my patients to place the cold flannel or pack on the injured area for no longer than 10 minutes at a time or if using a flannel until it warms up. This can be done 4-5 times throughout the day and continue the application for approximately 3-5 days following the injury. A cold pack can also be used to treat muscles that have been overused, you may have seen athletes sitting in cold baths or plunging into cold barrels after a hard training session…You can stick to a cold pack! This helps to reduce any inflammation that might have built up as a result of the activity. A heat pack such as a hot water bottles wrapped in a towel or a microwaveable cloth bags filled with rice should be applied tight, sore or stiff muscles as the helps to bring blood flow to the area and promote relaxation not to mention the comforting factor. It’s important to apply heat for only a limited amount of time. Fifteen to twenty minutes of heat can often provide the temporary relief needed at the moment. I sometimes recommend patients to do a hot/cold treatment. Yes both, not at the same time but one after another. Some tissues such as ligaments have a very low blood supply and therefore take longer to heal. Applying hot/cold treatment to a chronic injury (injury that is more than 4 weeks old) aids for faster recovery by creating a pumping action of the blood vessels. First apply the heat. The heat opens the blood vessels which in turn brings the necessary oxygen and nutrients to the area to promote healing. Then the cold. The cold constricts the blood vessels which then removes the waste such as stagnate inflammation and other metabolic waste out of the tissues. Hot or cold treatment for an injury or muscle soreness is generally a safe home care treatment. However, when using heat, watch for redness and discomfort. Never apply heat to an area that feels warm to the touch as this may indicate tissue damage such as swelling and inflammation. Be sure to wrap the heat with a towel to protect the skin from burning. This goes for the cold pack as well so to prevent it from freezing your skin. While apply hot or cold packs on an injured area is helpful in relieving pain, they are not the only way to alleviate pain. Having the area examined and treated properly by a osteopath will enable the body to heal correctly. If you have any further question or need any advice you can contact me on via email wini@winithomas.co.uk or call me on 07490 686 183.